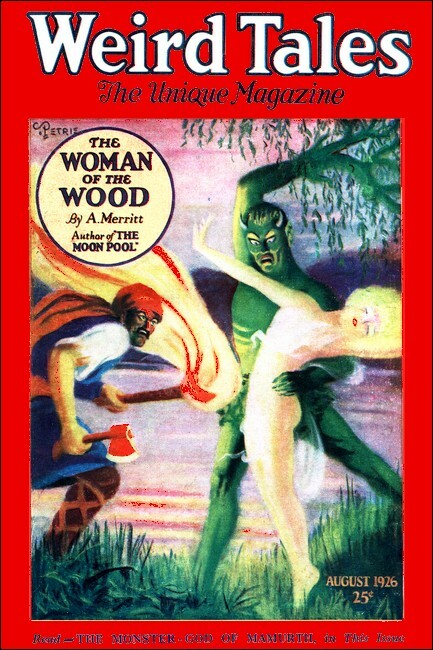 First published as "The Woman of the Wood"
Weird Tales, August 1926, with "The Woman of thr Wood"
Before him was the woman of the strange eyes and the face of unearthly beauty. McKay had worn the wings in the world war with honor, flying first with the French and later with his own country's forces. And as a bird loves the trees, so did McKay love them. To him they were not merely trunks and roots, branches and leaves; to him they were personalities. He was acutely aware of differences in character even among the same species—that pine was benevolent and jolly; that one austere and monkish; there stood a swaggering bravo, and there dwelt a sage wrapped in green meditation; that birch was a wanton—the birch near her was virginal, still a dream. And it was this that had kept McKay at the inn—a definite consciousness of appeal, consciousness of something wrong—something wrong that he was being asked to right. He strained his ears to catch words in the rustling branches, words that trembled on the brink of his human understanding. "Old Polleau does not love the trees, no," the old man had said. "No, nor do his two sons. They do not love the trees—and very certainly the trees do not love them." To McKay the silver birches were for all the world like some gay caravan of lovely demoiselles under the protection of debonair knights. With that odd other sense of his he saw the birches as delectable damsels, merry and laughing—the pines as lovers, troubadours in their green needled mail. 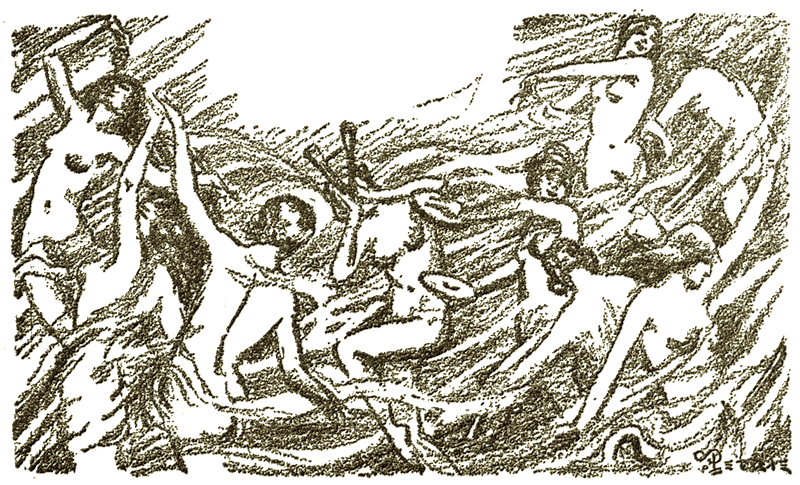 And when the winds blew and the crests of the trees bent under them, it was as though dainty demoiselles picked up fluttering, leafy skirts, bent leafy hoods and danced while the knights of the firs drew closer round them, locked arms with theirs and danced with them to the roaring horns of the winds. At such times he almost heard sweet laughter from the birches, shoutings from the firs. And two days ago he had seen Polleau and his two sons. McKay had been dreaming in the coppice all that afternoon. As dusk began to fall he had reluctantly arisen and begun the row back to the inn. When he had been a few hundred feet from shore three men had come out from the trees and had stood watching him—three grim, powerful men taller than the average French peasant. "Stop that!" he had cried, "Stop it, damn you!" 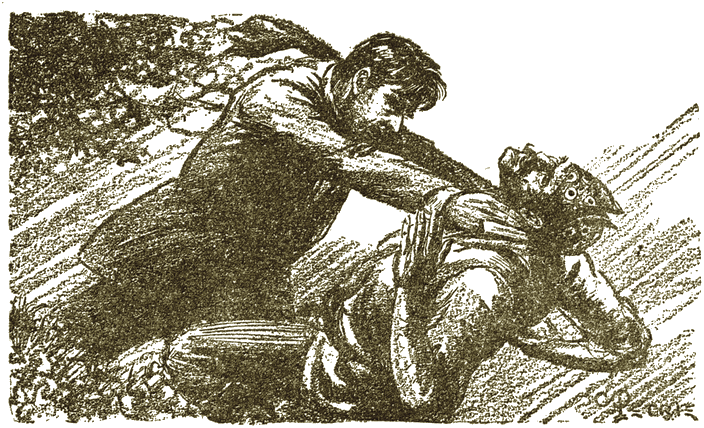 For answer the son had struck again—and never had McKay seen hate etched so deep as on his face as he struck. Cursing, a killing rage in heart, had swung the boat around, raced back to shore. He had heard the hatchet strike again and again and, close now to shore, had heard a crackling and over it once more the thin, high wailing. He had turned to look. For a moment Polleau and the standing son had stared at the sturdy fir with the silvery birch lying on its green breast and folded in, shielded by, its needled boughs as though—again the swift impression came to McKay —as though it were a wounded maid stretched on breast, in arms, of knightly lover. For a long moment father and son had stared. McKay, sitting on the balcony of the inn that morning, went over and over that scene; realized more and more clearly the human aspect of fallen birch and clasping fir, and the conscious deliberateness of the fir's blow. And during the two days that had elapsed since then, he had felt the unease of the trees increase, their whispering appeal became more urgent. Instantly McKay obeyed the command; he arose and walked down to the boat landing; he stepped into his skiff and began to row across the lake. As his oars touched the water his trouble fell from him. In its place flowed peace and a curious exaltation. They were alive—the mists; they formed themselves into fantastic palaces past whose opalescent facades he flew; they built themselves into hills and valleys and circled plains whose floors were rippling silk. Tiny rainbows gleamed out among them, and upon the water prismatic patches shone and spread like spilled wine of opals. He had the illusion of vast distances —the hills of mist were real mountains, the valleys between them were not illusory. He was a colossus cleaving through some elfin world. A trout broke, and it was like leviathan leaping from the fathomless deep. Around the arc of its body rainbows interlaced and then dissolved into rain of softly gleaming gems—diamonds in dance with sapphires, flame hearted rubies and pearls with shimmering souls of rose. The fish vanished, diving cleanly without sound; the jeweled bows vanished with it; a tiny irised whirlpool swirled for an instant where trout and flashing arcs had been. And suddenly he heard the sound of voices, many voices; faint at first and murmurous; louder they became, swiftly; women's voices sweet and lilting and mingled with them the deeper tones of men. Voices that lifted and fell in a wild, gay chanting through whose joyousness ran undertones both of sorrow and of rage—as though faery weavers threaded through silk spun of sunbeams sombre strands dipped in the black of graves and crimson strands stained in the red of wrathful sunsets. The rhythmic flittings ceased; there was now no movement as there was no sound among the trees—yet he felt the little woods abrim with watching life. McKay tried to speak; there was a spell of silence on his mouth. "You called me. I have come to listen to you—to help you if I can." A pillar of mist whirled forward and halted, eddying half an arm length away. And suddenly out of it peered a woman's face, eyes level with his own. A woman's face—yes; but McKay, staring into those strange eyes probing his, knew that face though it seemed it was that of no woman of human breed. They were without pupils, the irises deer-like and of the soft green of deep forest dells; within them sparkled tiny star points of light like motes in a moon beam. The eyes were wide and set far apart beneath a broad, low brow over which was piled braid upon braid of hair of palest gold, braids that seemed spun of shining ashes of gold. Her nose was small and straight, her mouth scarlet and exquisite. The face was oval, tapering to a delicately pointed chin. "He shall hear," whispered the red lips. Immediately from all about him a cry arose; in it was the whispering and rustling of the leaves beneath the breath of the winds, the shrilling of the harp strings of the boughs, the laughter of hidden brooks, the shoutings of waters flinging themselves down to deep and rocky pools—the voices of the woods made articulate. "He shall hear!" they cried. "He shall speak," whispered the scarlet lips. "He shall speak!" answered the wood voices again, as though in litany. "He shall see," whispered the woman and the cool fingers touched his eyes. "He shall see!" echoed the wood voices. The mists that had hidden the coppice from McKay wavered, thinned and were gone. In their place was a limpid, translucent, palely green ether, faintly luminous—as though he stood within some clear wan emerald. His feet pressed a golden moss spangled with tiny starry bluets. Fully revealed before him was the woman of the strange eyes and the face of elfin beauty. He dwelt for a moment upon the slender shoulders, the firm small tip-tilted breasts, the willow litheness of her body. From neck to knees a smock covered her, sheer and silken and delicate as though spun of cobwebs; through it her body gleamed as though fire of the young Spring moon ran in her veins. Beyond her, upon the golden moss were other women like her, many of them; they stared at him with the same wide set green eyes in which danced the clouds of sparkling moonbeam motes; like her they were crowned with glistening, pallidly golden hair; like hers too were their oval faces with the pointed chins and perilous elfin beauty. Only where she stared at him gravely, measuring him, weighing him—there were those of these her sisters whose eyes were mocking; and those whose eyes called to him with a weirdly tingling allure, their mouths athirst; those whose eyes looked upon him with curiosity alone and those whose great eyes pleaded with him, prayed to him. Within that pellucid, greenly luminous air McKay was abruptly aware that the trees of the coppice still had a place. Only now they were spectral indeed; they were like white shadows cast athwart a glaucous screen; trunk and bough, twig and leaf they arose around him and they were as though etched in air by phantom craftsmen—thin, unsubstantial; they were ghost trees rooted in another space. Suddenly he was aware that there were men among the women; men whose eyes were set wide apart as were theirs, as strange and pupilless as were theirs but with irises of brown and blue; men with pointed chins and oval faces, broad shouldered and clad in kirtles of darkest green; swarthy-skinned men muscular and strong, with that same lithe grace of the women—and like them of a beauty alien and elfin. 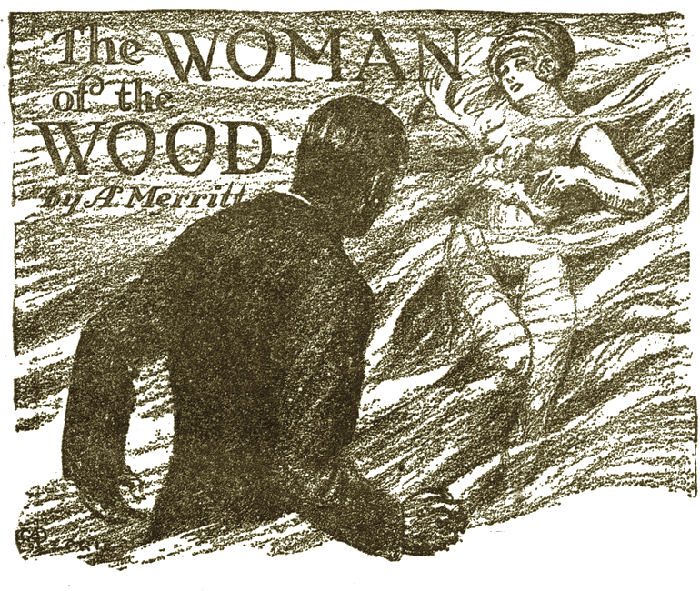 "She withers," sighed the woman, and in her voice McKay heard a faint rustling as of mournful leaves. "Now is it not pitiful that she withers —our sister who was so young, so slender and so lovely?" McKay looked again at the girl. The white skin seemed shrunken; the moon radiance that gleamed through the bodies of the others in hers was dim and pallid; her slim arms hung listlessly; her body drooped. The mouth too was wan and parched, the long and misted green eyes dull. The palely golden hair lusterless, and dry. He looked on slow death—a withering death. "May the arm that struck her down wither!" the green clad man who held her shouted, and in his voice McKay heard a savage strumming as of winter winds through bleak boughs: "May his heart wither and the sun blast him! May the rain and the waters deny him and the winds scourge him!" "I thirst," whispered the girl. "It is healed," said the woman gently. "And it was your turn little sister. The wound is healed. Soon, you will have forgotten." The woman with the chalice knelt and set it to the wan, dry lips of her who was—withering. She drank of it, thirstily, to the last drop. The misty eyes cleared, they sparkled; the lips that had been so parched and pale grew red, the white body gleamed as though the waning light had been fed with new. "Sing, sisters," she cried, and shrilly. "Dance for me, sisters!" "Sing, sisters," the girl cried shrilly. "Dance for me, sisters!" Again burst out that chant McKay had heard as he had floated through the mists upon the lake. Now, as then, despite his opened ears, he could distinguish no words, but clearly he understood its mingled themes— the joy of Spring's awakening, rebirth, with the green life streaming singing up through every bough, swelling the buds, burgeoning with tender leaves the branches; the dance of the trees in the scented winds of Spring; the drums of the jubilant rain on leafy hoods; passion of Summer sun pouring its golden flood down upon the trees; the moon passing with stately step and slow and green hands stretching up to her and drawing from her breast milk of silver fire; riot of wild gay winds with their mad pipings and strummings;— soft interlacing of boughs, the kiss of amorous leaves—all these and more, much more that McKay could not understand since it dealt with hidden, secret things for which man has no images, were in that chanting. "Yet she withers," she said. "And not all our life, if we poured it through her lips, could save her." "Take them away! Take away your hands! They burn me!" she moaned. "He tries to help you," whispered the green clad man, gently. But he reached over and drew McKay's hands away. "Not so can you help her," said the woman. "What can I do?" McKay arose, looked helplessly from one to the other. "What can I do to help?" The chanting died, the dance stopped. A silence fell and he felt upon him the eyes of all. They were tense—waiting. The woman took his hands. Their touch was cool and sent a strange sweetness sweeping through his veins. "There are three men yonder," she said. "They hate us. Soon we shall be as she is there—withering. They have sworn it, and as they have sworn so will they do. Unless—"
She paused; and McKay felt the stirrings of a curious unease. The moonbeam-dancing motes in her eyes had changed to tiny sparklings of red. In a way, deep down, they terrified him—those red sparklings. "Three men? "—in his clouded mind was the memory of Polleau and his two strong sons. "Three men," he repeated, stupidly—"But what are three men to you who are so many? What could three men do against those stalwart gallants of yours?" "No," she shook her head. "No—there is nothing our—men —can do; nothing that we can do. Once, night and day, we were gay. Now we fear—night and day. They mean to destroy us. Our kin have warned us. And our kin cannot help us. Those three are masters of blade and flame. Against blade and flame we are helpless." "Blade and flame!" echoed the listeners. "Against blade and flame we are helpless." "Surely will they destroy us," murmured the woman. "We shall wither all of us. Like her there, or burn—unless—"
"You shall not die!" he cried. "No—by God, you shall not!" "They have sworn to destroy us," she said, "and soon. With blade and flame they will destroy us—these three—unless—"
"Unless you—slay them first!" she answered. "Slay!" he heard her whisper—and she was gone. The spectral trees wavered; their outlines thickened out of immateriality into substance. The green translucence darkened. He had a swift vertiginous moment as though he swung between two worlds. He closed his eyes. The vertigo passed and he opened them, looked around him. Upon his hands the touch of that bark was like—was like?— yes, curiously was it like the touch of the long slim hands of the woman of the scarlet lips. But it gave him none of that alien rapture, that pulse of green life her touch had brought. Yet, now as then, the touch steadied him. The outlines of girl and man were gone. "Slay!" he heard them whisper—and again: "Slay! Help us! Slay!" "Slay!" they whispered. "Slay them! Save us! Slay!" "I will slay! I will save you!" McKay, panting, hammer pulse beating in his ears, rushing through the woods heard himself answering that ever louder, ever more insistent command. And in his mind was but one desire—to clutch the throats of Polleau and his sons, to crack their necks; to stand by them then and watch them wither; wither like that slim girl in the arms of the green clad man. He lay there, marshaling his thoughts into some order of sanity. What had he been about to do? To rush berserk upon those three who lived in the old lodge and—kill them! And for what? Because that elfin, scarlet lipped woman whose kisses he still could feel upon his mouth had bade him! Because the whispering trees of the little wood had maddened him with that same command! What were that woman and her sisters and the green clad swarthy gallants of theirs? Illusions of some waking dream—phantoms born of the hypnosis of the swirling mists through which he had rowed and floated across the lake? Such things were not uncommon. McKay knew of those who by watching the shifting clouds could create and dwell for a time with wide open eyes within some similar land of fantasy; knew others who needed but to stare at smoothly falling water to set themselves within a world of waking dream; there were those who could summon dreams by gazing into a ball of crystal, others found their phantoms in saucers of shining ebon ink. Might not the moving mists have laid those same hypnotic fingers upon his own mind—and his love for the trees the sense of appeal that he had felt so long and his memory of the wanton slaughter of the slim birch have all combined to paint upon his drugged consciousness the phantasms he had beheld? McKay arose to his feet, shakily enough. He looked back at the coppice. There was no wind now, the leaves were silent, motionless. Again he saw it as the caravan of demoiselles with their marching knights and troubadours. But no longer was it gay. The words of the scarlet lipped woman came back to him —that gaiety had fled and fear had taken its place. Dream phantom or —dryad, whatever she was, half of that at least was truth. He turned, a plan forming in his mind. Reason with himself as he might, something deep within him stubbornly asserted the reality of his experience. At any rate, he told himself, the little wood was far too beautiful to be despoiled. He would put aside the experience as dream—but he would save the little wood for the essence of beauty that it held in its green cup. "What do you want?" demanded Polleau, curtly. "I am a neighbor of yours, stopping at the inn—" began McKay, courteously. "I know who you are," Polleau interrupted brusquely, "But what is it that you want?" "I find the air of this place good for me," McKay stifled a rising anger. "I am thinking of staying for a year or more until my health is fully recovered. I would like to buy some of your land and build me a lodge upon it." "Yes, M'sieu?" there was acid politeness now in the powerful old man's voice. "But is it permitted to ask why you do not remain at the inn? Its fare is excellent and you are well liked there." "I have desire to be alone," replied McKay. "I do not like people too close to me. I would have my own land, and sleep under my own roof." "But why come to me?" asked Polleau. "There are many places upon the far side of the lake that you could secure. It is happy there, and this side is not happy, M'sieu. But tell me, what part of my land is it that you desire?" "That little wood yonder," answered McKay, and pointed to the coppice. "Ah! I thought so!" whispered Polleau, and between him and his sons passed a look of bitter understanding. He looked at McKay, somberly. "That wood is not for sale, M'sieu," he said at last. "I can afford to pay well for what I want," said McKay. "Name your price." "It is not for sale," repeated Polleau, stolidly, "at any price." "Oh, come," laughed McKay, although his heart sank at the finality in that answer. "You have many acres and what is it but a few trees? I can afford to gratify my fancies. I will give you all the worth of your other land for it." "You have asked what that place that you so desire is, and you have answered that it is but a few trees," said Polleau, slowly, and the tall son behind him laughed, abruptly, maliciously. "But it is more than that, M'sieu —Oh, much more than that. And you know it, else why would you pay such price? Yes, you know it—since you know also that we are ready to destroy it, and you would save it. And who told you all that, M'sieu?" he snarled. "But a few trees!" snarled old Polleau. "Then who told him what we mean to do—eh, Pierre?" Again the son laughed. And at that laughter McKay felt within him resurgence of his own blind hatred as he had fled through the whispering wood. He mastered himself, turned away, there was nothing he could do— now. Polleau halted him. "M'sieu," he said, "Wait. Enter. There is something I would tell you; something too I would show you. Something, perhaps, that I would ask you." "Look, M'sieu," he said and lifted the bandage. "Good God, Polleau!" he cried. "But this man needs medical attention. I know something of wounds. Let me go across the lake and bring back my kit. I will attend him." "It heals," he said. "We have some skill in such things. You saw what did it. You watched from your boat as the cursed tree struck him. The eye was crushed and lay upon his cheek. I cut it away. Now he heals. We do not need your aid, M'sieu." "Yet he ought not have cut the birch," muttered McKay, more to himself than to be heard. "Why not?" asked old Polleau, fiercely, "Since it hated him." McKay stared at him. What did this old peasant know? The words strengthened that deep stubborn conviction that what he had seen and heard in the coppice had been actuality—no dream. And still more did Polleau's next words strengthen that conviction. "M'sieu," he said, "you come here as ambassador—of a sort. The wood has spoken to you. Well, as ambassador I shall speak to you. Four centuries my people have lived in this place. A century we have owned this land. M'sieu, in all those years there has been no moment that the trees have not hated us—nor we the trees. "For all those hundred years there have been hatred and battle between us and the forest. My father, M'sieu, was crushed by a tree; my elder brother crippled by another. My father's father, woodsman that he was, was lost in the forest—he came back to us with mind gone, raving of wood women who had bewitched and mocked him, luring him into swamp and fen and tangled thicket, tormenting him. In every generation the trees have taken their toll of us—women as well as men—maiming or killing us." "Accidents," interrupted McKay. "This is childish, Polleau. You cannot blame the trees." "In your heart you do not believe so," said Polleau. "Listen, the feud is an ancient one. Centuries ago it began when we were serfs, slaves of the nobles. To cook, to keep us warm in winter, they let us pick up the fagots, the dead branches and twigs that dropped from the trees. But if we cut down a tree to keep us warm, to keep our women and our children warm, yes, if we but tore down a branch—they hanged us, or they threw us into dungeons to rot, or whipped us till our backs were red lattices. "They had their broad fields, the nobles—but we must raise our food in the patches where the trees disdained to grow. And if they did thrust themselves into our poor patches, then, M'sieu, we must let them have their way—or be flogged, or be thrown into the dungeons or be hanged. "They pressed us in—the trees," the old man's voice grew sharp with fanatic hatred. "They stole our fields and they took the food from the mouths of our children; they dropped their fagots to us like dole to beggars; they tempted us to warmth when the cold struck our bones—and they bore us as fruit a-swing at the end of the foresters' ropes if we yielded to their tempting. "Yes, M'sieu—we died of cold that they might live! Our children died of hunger that their young might find root space! They despised us —the trees! We died that they might live—and we were men! "Then, M'sieu came the Revolution and the freedom. Ah, M'sieu, then we took our toll! Great logs roaring in the winter cold—no more huddling over the alms of fagots. Fields where the trees had been—no more starving of our children that theirs might live. Now the trees were the slaves and we the masters. "And the trees knew and they hated us! "The trees!" shrieked Polleau, suddenly, eyes blazing red rage, face writhing, foam at the corners of his mouth and gray hair clutched in rigid hands—"The cursed trees! Armies of the trees creeping— creeping—closer, ever closer—crushing us in! Stealing our fields as they did of old! Building their dungeon round us as they built of old the dungeons of stone! Creeping—creeping! Armies of trees! Legions of trees! The trees! The cursed trees!" McKay listened, appalled. Here was crimson heart of hate. Madness! But what was at the root of it? Some deep inherited instinct, coming down from forefathers who had hated the forest as the symbol of their masters. Forefathers whose tides of hatred had overflowed to the green life on which the nobles had laid their tabu—as one neglected child will hate the favorite on whom love and gifts are lavished? In such warped minds the crushing fall of a tree, the maiming sweep of a branch, might well appear as deliberate, the natural growth of the forest seem the implacable advance of an enemy. "Patience," the standing son touched the old man's shoulder. "Patience! Soon we strike our blow." "Though we cut down a hundred," he whispered, "By the hundred they return! But one of us, when they strike—he does not return. No! They have numbers and they have—time. We are now but three, and we have little time. They watch us as we go through the forest, alert to trip, to strike, to crush! "But M'sieu," he turned blood-shot eyes to McKay. "We strike our blow, even as Pierre has said. We strike at the coppice that you so desire. We strike there because it is the very heart of the forest. There the secret life of the forest runs at full tide. We know—and you know! Something that, destroyed, will take the heart out of the forest—will make it know us for its masters." "The women!" the standing son's eyes glittered, "I have seen the women there! The fair women with the shining skins who invite—and mock and vanish before hands can seize them." "The fair women who peer into our windows in the night—and mock us!" muttered the eyeless son. "They shall mock no more!" shouted Polleau, the frenzy again taking him. "Soon they shall lie, dying! All of them—all of them! They die!" "Go tell them that!" he shouted. "Say to them that this very day we destroy them. Say to them it is we who will laugh when winter comes and we watch their round white bodies blaze in this hearth of ours and warm us! Go —tell them that!" He spun McKay around, pushed him to the door, opened it and flung him staggering down the steps. He heard the tall son laugh, the door close. Blind with rage he rushed up the steps and hurled himself against the door. Again the tall son laughed. McKay beat at the door with clenched fists, cursing. The three within paid no heed. Despair began to dull his rage. Could the trees help him—counsel him? He turned and walked slowly down the field path to the little wood. "Let me see again!" he whispered. "Let me hear! Speak to me!" And suddenly it seemed to McKay that he was a madman—as mad as Polleau and his sons. Calmly, he went over the old peasant's indictment of the forest; recalled the face and eyes filled with the fanatic hate. Madness! After all, the trees were—only trees. Polleau and his sons—so he reasoned—had transferred to them the bitter hatred their forefathers had felt for those old lords who had enslaved them; had laid upon them too all the bitterness of their own struggle to exist in this high forest land. When they struck at the trees, it was the ghosts of these forefathers striking at the nobles who had oppressed them; it was themselves striking against their own destiny. The trees were but symbols. It was the warped minds of Polleau and his sons that clothed them in false semblance of conscious life in blind striving to wreak vengeance against the ancient masters and the destiny that had made their lives hard and unceasing battle against Nature. The nobles were long dead; destiny can be brought to grips by no man. But the trees were here and alive. Clothed in mirage, through them the driving lust for vengeance could be sated. And he, McKay, was it not his own deep love and sympathy for the trees that similarly had clothed them in that false semblance of conscious life? Had he not built his own mirage? The trees did not really mourn, could not suffer, could not—know. It was his own sorrow that he had transferred to them; only his own sorrow that he felt echoing back to him from them. McKay, bewildered, leaped to his feet. Reason told him that it was the wind—yet there was no wind! And as he stood there, a sighing arose as though a mournful breeze were blowing through the trees—and again there was no wind! "They come! They come! Farewell sisters! Sisters—farewell!" "Go back!" he shouted. "Go back, Polleau! I warn you!" "He warns us!" jeered Polleau. "He—Pierre, Jean—he warns us!" He tripped and fell backward, McKay upon him. 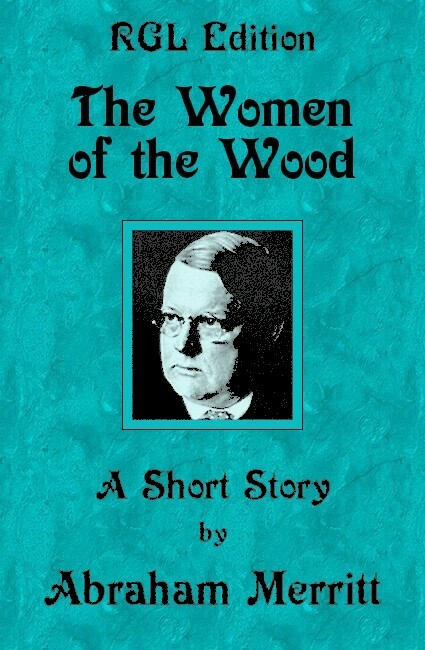 And all that time McKay heard the little wood shouting. Gone from it now was all mournfulness, all passive resignation. The wood was alive and raging. He saw the trees shake and bend as though torn by a tempest. Dimly he realized that the others must hear none of this, see none of it; as dimly wondered why this should be. "Kill!" they whispered. "Let his blood flow! Kill! Let his blood flow!" "Kill!" whispered the shadowy men. They ringed him, their song bird-sweet and shrill; jubilant. Beyond them he saw gliding toward him the woman of the misty pillars whose kisses had poured the sweet green fire into his veins. Her arms were outstretched to him, her strange wide eyes were rapt on his, her white body gleamed with the moon radiance, her red lips were parted and smiling—a scarlet chalice filled with the promise of undreamed ecstasies. The dancing circle, chanting, broke to let her through. Abruptly, a horror filled McKay. Not of this fair woman, not of her jubilant sisters—but of himself. "Come back!" the woman whispered, and held out to him slender arms. McKay hesitated, his horror lessening in that clear, wise, pitying gaze. He half swung the boat around. His gaze dropped upon his blood-stained hands and again the hysteria gripped him. One thought only was in his mind— to get far away from where Polleau's son lay with his throat ripped open, to put the lake between that body and him. For a time he rowed aimlessly, finding in the exertion a lessening of his soul sickness. His numbed mind began to function, analyzing his plight, planning how to meet the future—how to save him. What ought he do? Confess that he had killed Polleau's son? What reason could he give? Only that he had killed because the man had been about to cut down some trees—trees that were his father's to do with as he willed! And if he told of the wood woman, the wood women, the shadowy shapes of their green gallants who had helped him—who would believe? They would think him mad—mad as he half believed himself to be. No, none would believe him. None! Nor would confession bring back life to him he had slain. No; he would not confess. But stay—another thought came! Might he not be—accused? What actually had happened to old Polleau and his other son? He had taken it for granted that they were dead; that they had died under those bodies white and swarthy. But had they? While the green sorcery had meshed him he had held no doubt of this—else why the jubilance of the little wood, the triumphant chanting of the forest? Were they dead—Polleau and the one-eyed son? Clearly it came to him that they had not heard as he had, had not seen as he had. To them McKay and his enemy had been but two men battling, in a woodland glade; nothing more than that—until the last! Until the last? Had they seen more than that even then? No, all that he could depend upon as real was that he had ripped out the throat of one of old Polleau's sons. That was the one unassailable verity. He had washed the blood of that man from his hands and his face. All else might have been mirage—but one thing was true. He had murdered Polleau's son! Remorse? He had thought that he had felt it. He knew now that he did not; that he had no shadow of remorse for what he had done. It had been panic that had shaken him, panic realization of the strangenesses, reaction from the battle lust, echoes of the war. He had been justified in that— execution. What right had those men to destroy the little wood; to wipe wantonly its beauty away? McKay undressed, hid the stained shirt in his traveling trunk, bathed and put on a fresh outfit, sauntered down to dinner. He ate excellently. Wonder now and then crossed his mind that he felt no regret, no sorrow even, for the man he had killed. Half he was inclined to believe it all a dream—so little of any emotion did he feel. He had even ceased to think of what discovery might mean. His mind was quiet; he heard the forest chanting to him that there was nothing he need fear; and when he sat for a time that night upon the balcony a peace that was half an ecstasy stole in upon him from the murmuring woods and enfolded him. Cradled by it he slept dreamlessly. "It is strange," he said at last to McKay as the sun was dipping behind the summits. "Polleau was to see me here today. He never breaks his word. If he could not come he would have sent one of his sons." "There is another thing I do not understand," went on the old man. "I have seen no smoke from the lodge all day. It is as though they were not there." "Where could they be?" asked McKay, indifferently. "I do not know," the voice was more perturbed. "It all troubles me, M'sieu. Polleau is hard, yes; but he is my neighbor. Perhaps an accident—"
"They would let you know soon enough if there was anything wrong," McKay said. "Perhaps, but—" the old man hesitated. "If he does not come tomorrow and again I see no smoke I will go to him," he ended. McKay felt a little shock run through him—tomorrow then he would know, definitely know, what it was that had happened in the little wood. "I would if I were you," he said. "I'd not wait too long either. After all —well, accidents do happen." "Will you go with me, M'sieu," asked the old man. "No!" whispered the warning voice within McKay. "No! Do not go!" "Sorry," he said, aloud. "But I've some writing to do. If you should need me send back your man. I'll come." "Everything all right?" he called as they were near. They did not answer; but as the skiff warped against the landing they looked up at him and on their faces were stamped horror and a great wonder. "They are dead, M'sieu," whispered the innkeeper. "Polleau and his two sons—all dead!" "Dead!" he cried. "What killed them?" "What but the trees, M'sieu?" answered the old man, and McKay thought his gaze dwelt upon him strangely. "The trees killed them. See—we went up the little path through the wood, and close to its end we found it blocked by fallen trees. The flies buzzed round those trees, M'sieu, so we searched there. They were under them, Polleau and his sons. A fir had fallen upon Polleau and had crushed in his chest. Another son we found beneath a fir and upturned birches. They had broken his back, and an eye had been torn out —but that was no new wound, the latter." He paused. "It must have been a sudden wind," said his man. "Yet I never knew of a wind like that must have been. There were no trees down except those that lay upon them. And of those it was as though they had leaped out of the ground! Yes, as though they had leaped out of the ground upon them. Or it was as though giants had torn them out for clubs. They were not broken—their roots were bare—"
"But the other son—Polleau had two? "—try as he might, McKay could not keep the tremor out of his voice. "Pierre," said the old man, and again McKay felt that strange quality in his gaze. "He lay beneath a fir. His throat was torn out!" "His throat torn out!" whispered McKay, His knife! The knife that had been slipped into his hand by the shadowy shapes! "His throat was torn out," repeated the innkeeper. "And in it still was the broken branch that had done it. A broken branch, M'sieu, pointed as a knife. It must have caught Pierre as the fir fell and ripping through his throat—been broken off as the tree crashed." McKay stood, mind whirling in wild conjecture. "You said—a broken branch?" McKay asked through lips gone white. "A broken branch, M'sieu," the innkeeper's eyes searched him. "It was very plain—what it was that happened. Jacques," he turned to his man. "Go up to the house." He watched until the man shuffled out of sight. "Yet not all plain, M'sieu," he spoke low to McKay. "For in Pierre's hand I found— this." "Tell me nothing, M'sieu," the old innkeeper turned to him, "Polleau was hard and hard men, too, were his sons. The trees hated them. The trees killed them. And now the trees are happy. That is all. And the—souvenir —is gone. I have forgotten I saw it. Only M'sieu would better also —go." That night McKay packed. When dawn had broken he stood at his window, looked long at the little wood. It was awakening, stirring sleepily like drowsy delicate demoiselles. He drank in its beauty—for the last time; waved it farewell. McKay breakfasted well. He dropped into the driver's seat; set the engine humming. The old innkeeper and his wife, solicitous as ever for his welfare, bade him Godspeed. On both their faces was full friendliness—and in the old man's eyes somewhat of puzzled awe. And singing went McKay, soft whisperings of leaves following him, glad chanting of needled pines; the voice of the forest tender, friendly, caressing—the forest pouring into him as farewell gift its peace, its happiness, its strength.